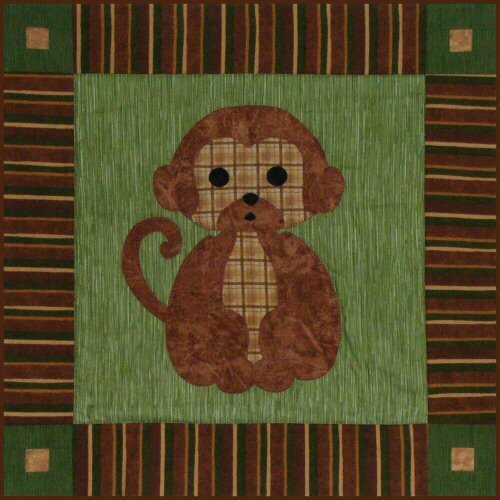 Quilt Wallhanging Size: 21" x 21"
This Emmett the Monkey baby quilt pattern is the nineth in a series of sweet wallhangings you can make to decorate any nursery. I use colourful clothes pins with silk ribbons added to hang them. You can see all of the Stuffies Family of Baby Quilt Patterns and how to make them into large quilts here. To see pictures of the Stuffies baby quilt patterns made using these patterns, click here. Fat Quarter of main Emmett print and body parts, plus a scrap of tone-on-tone fabric for his nose and eyes. Fat Quarter of tone-on-tone fabric for the background. 2 Fat Quarters & a scrap of fabric for the border and corner squares. If you'd like to create a striped border with custom colours, you will find my free pattern here.